In celebration of National Pencil Day today, I’d like to highlight some of my favorite woodcase pencils here. These are not favorite of all time, which would be nearly impossible to choose, but just pencils that I really like and keep reaching for. Coincidentally, they are all black. 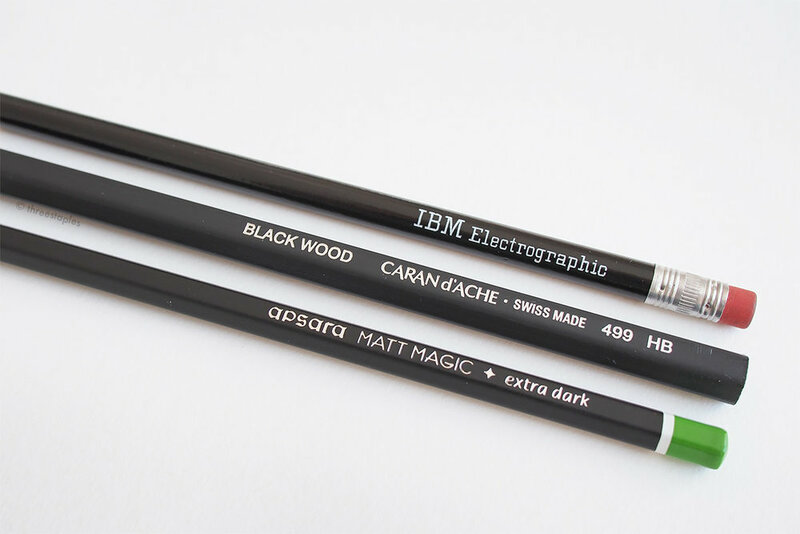 The IBM Electrographic pencil has been my favorite for a few years now. It has a special place in my heart because it’s the first vintage pencil that I fell in love with, pushing me further down the pencil rabbit hole. I got a black hexagonal version first from CW Pencils in 2015, and my immediate reaction after trying it was to look for a dozen. I now have a small stash of 3 different versions of it, but for some reason I like this round, black version the best (found on eBay). I love how dark and soft the graphite is, and have used up many so far solving crossword puzzles. Since they’re vintage, the red erasers are no longer serviceable, but I’ve topped them with Pentel Hi-Polymer eraser caps, or taken them out entirely and replaced them with eraser pen refills that I cut to size. I love the idea of jumbo pencils. It’s not nostalgia or playfulness that attracts me to them, because I did not grow up with jumbo pencils. Just something about a chunky pencil makes me feel like I’m being super productive and, weirdly, painterly. I tried a bunch but none of them wowed me, until I met this Black Wood. What a beauty. 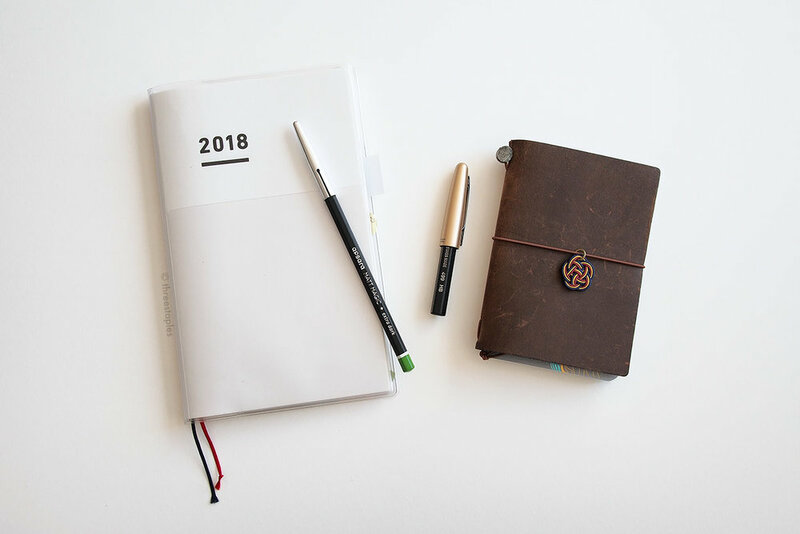 With sophisticated all-black design and buttery graphite that glides, I knew instantly I’d met my go-to jumbo pencil. It also opened my eyes to the brand Caran d’Ache. These days, I use Black Wood regularly with my Jibun Techo (it’s especially nice on Tomoe River paper), and I sharpen it with the double-hole sharpener from Möbius & Ruppert. I’ve only tried a few pencils from Apsara so far, but I’ve liked them all. This Matt Magic is no exception and has quickly become my favorite regular pencil. I just love everything about it, from the colorful dyed wood, to its quirky name. As with all pencils, it’s hard to describe how it writes and feels, but there’s something effortless about the core that I really enjoy. It’s dark and smooth, but not in a crumbly way. And the whole pencil just feels firm and solid in construction, more so than a lot of other pencils. Maybe I'm making stuff up. Anyway, at less than a dollar each, I'm totally going to get more in different wood colors. These days, I use pencils mostly in my planner (Jibun Techo, left) and Field Notes (inserted in Traveler's Notebook cover on the right). Inspired by Tim Wasem on Erasable Podcast, I put Pilot Metropolitan fountain pen cap on Black Wood. The fit is a tad loose, but it’ll do for now. Happy National Pencil Day! ✏️ 💛 What are your favorite pencils these days? I purchased Caran d'Ache Black Wood and Apsara Matt Magic at CW Pencils. I have no affiliation with them. Jumbo Pencil Round-Up — the weekly pencil.